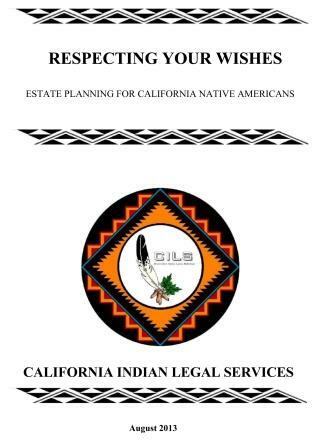 CILS recently published a 37-page booklet entitled, “Respecting Your Wishes: Estate Planning for California Native Americans.” The booklet is intended as a starting point of discussion on an often difficult subject, not as a comprehensive guide. Included is basic information on estate planning issues for the Native American population in California, including advanced planning for health and finances, Wills, trusts, non-probate transfers, the probate process, and federally held Native American trust assets. The booklet is available at no cost. Click on the icon to download or find it in our Self Help section. Here is the latest update in the Adoptive Couple v. Baby Girl legal battle. On August 5, 2013 the South Carolina Family Law Court issued an order for the immediate transfer of Baby Girl Veronica to the adoptive parents and suspension of the Transition Order. The order was issued as a result of the father’s and his representatives’ failure to attend a transition meeting held on August 4, 2013. According to the court, the Transition Order provides that if any party fails to comply with the order, the court retains jurisdiction to suspend the order and take further action in the case. In light of the final Decree of Adoption, the court found that Baby Girl Veronica is being unlawfully withheld from her lawful parents and referred the matter to the County Solicitor’s Office and the United States Attorney’s Office for prompt action. The order is also being referred to the father’s National Guard commanding officer. The court requests that the appropriate court in the State of Oklahoma order the father and any person having physical custody of Veronica to appear in an Oklahoma proceeding with the child. Finally, the court has directed legal counsel for the father to submit a letter to the court informing it of the whereabouts of the father and Veronica, the father’s intent to comply with the order, and their personal efforts to enforce compliance. There has been no update on the status of the South Carolina Federal District Court action filed by the Native American Rights Fund action on behalf of Veronica seeking to protect her rights to due process. California Indian Legal Services will continue to keep you updated on the development in the Baby Girl case. Here is the latest update in the Adoptive Couple v. Baby Girl legal battle. On July 30, 2013 the Native American Rights Fund filed suit in the Federal District Court of South Carolina to protect the civil rights of Baby Girl Veronica who is alleged to be denied her rights to due process in the South Carolina courts. The filing comes after the South Carolina Supreme Court issued two controversial orders to the Family Law Court calling for the removal of Veronica from her father and transferring her to the adoptive couple without a hearing on what is in her best interest. The complaint is supported by a national statement of support of Veronica’s civil rights, signed by child welfare workers, adoption advocates, legal authorities, tribal governments and Native American advocacy groups. California Indian Legal Services, California tribes, California Indian law firms, and the California Association of Tribal Governments all signed the statement of support. Yesterday, August 1, 2013 the Family Law Court issued an order granting the adoption petition of the adoptive couple and approving a transition plan. The Family Law Court’s orders are under seal and not available to the public. The hearing appears to be premature in light of the fact that the United States Supreme Court is scheduled to issue an order today, August 2nd, on whether to grant the Cherokee Nation’s and Dusten Brown’s request for a stay of the Family Law Court hearing on the final adoption until a “best interest of the child” hearing can be held. The adoptive couple filed their opposition to the Supreme Court stay on July 30, 2013.